You are currently browsing the archives for the tag 'sparkling'. 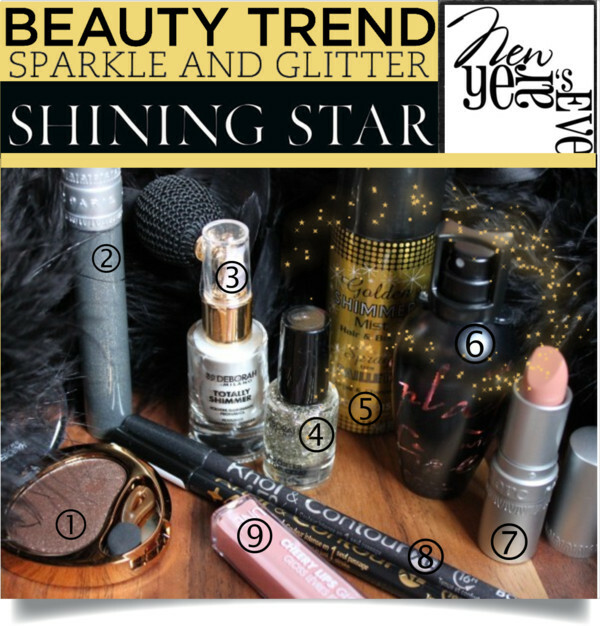 New Year’s Eve is all about sparkling and glittering shades. No reason to be modest, it is that time of the year when more is more. Shine and party all night long. Here are some products that I personally find amazing and that are going easy on your budget. This metallic eyeshadow can be used dry and wet. For voluminous lashes in black with golden sparkles. The perfect shimmer for face and body. Top off your favourite nail polish with this sparkling top coat. Golden sparkles for your hair that add enchantment to every movement. A floral-gourmand scent, seductive and warm with vanilla, jasmine, orchid, plum, orange blossom and tuberose. Intense eye colour in just one stroke. A colourful and nourishing formula that covers the lips beautifully while lasting up to 8 hours. Crystals, the new sparkling bangles collection by Sal y Limon, is just perfect for Christmas. Those handmade fun jewelry pieces will make you shine like a star or be the perfect surprise for a beloved friend. Available in many colours for CHF 54.- each, in Switzerland at Globus, Companys, Feldpausch, Schild and Loeb. One lucky reader has the chance to win a set of three bangles (orange, pink, fuchsia). Send me an e-mail with your address and the header “Christmas Bangles” to . All entries must be received until December 16st, 2012. No purchase or payment of any kind is necessary to enter or win this contest. By entering this contest, entrants accept and agree to be bound by these official rules. Today I drove to Milan for Fashion Week S/S 2012. It is actually pretty nice to take the car as there is so much space to fit in all the lovely outfits. 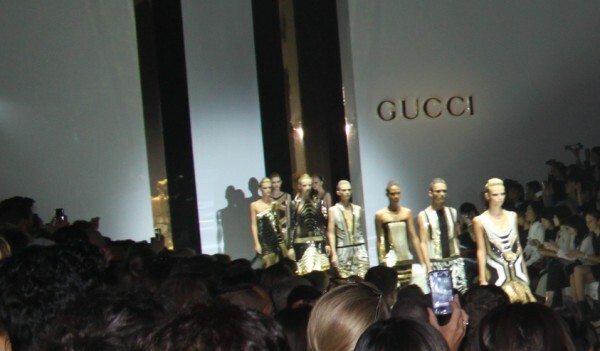 My first show was Gucci. As you know, I love the Italian brand. Frida Giannini started of the show with some iconic prints and the combination of green and black. There was a lot of black and white to follow, definitely less colours than her two last seasons. Sharp tailored pants with cropped jackets. Fringes were all over. 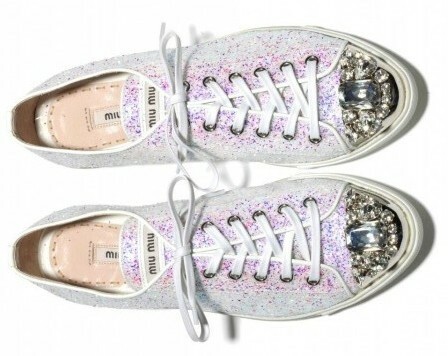 Next summer, there will be a lot of glitter and shine. Sparkling sequined flapper dresses, reminiscent of the Roaring Twenties, finished of this very wearable, beautiful collection. Are you a Gucci girl? I surely am… stay tuned for the outfit I wore today (…and somebody else, too!). 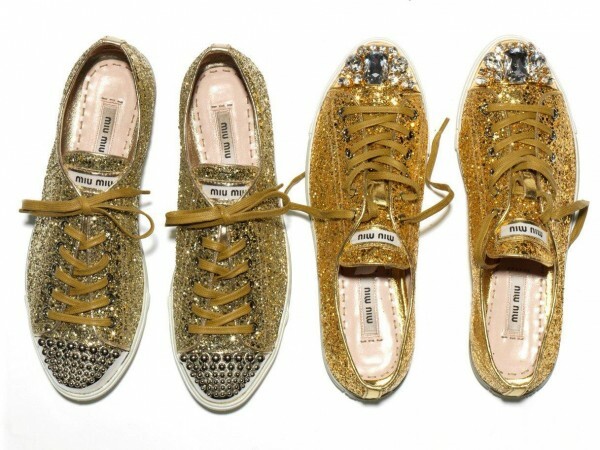 Miu Miu launches its new Sneakers, a brand new addition to the Miu Miu F/W 2011 collection. 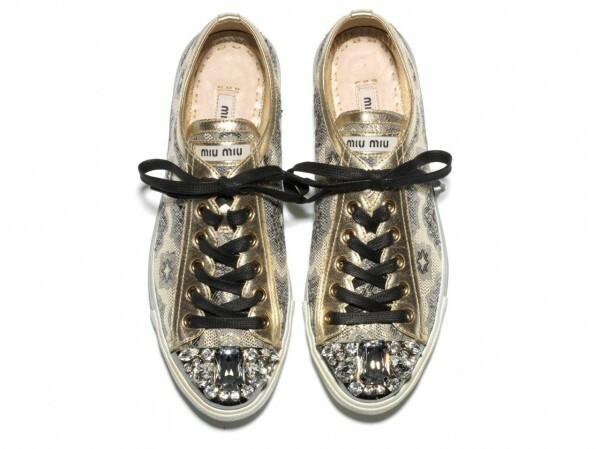 Made of iconic materials such as patent leather, arabesque lamé and velvet, the Miu Miu Sneakers are decorated with glitter, metal tips, or appliquéd crystals. As there were lots of sparkling materials on the F/W 2011 runways, those shoes are a must for all fashionistas. Coming in various colours including blush, silver, gold and black, the new Sneakers will be available in all the brand’s boutiques and online on miumiu.com starting from August, €295.